Sadly I didn't go to the Tokyo Quilt show this year but someone else did and has posted their photos on Flickr. Tokyo Quilt Show 2012 . My personal favourite is 'Born Free' by Miyoko Miyata, the quilt which is grey with a green seedling. Looks a bit like the idea for the movie WallE. Here is my entry for the Bernina New Zealand Icons Challenge. I had real problems coming up with an idea for this quilt challenge. I felt I had 'done' New Zealand icons already, NZ cabbage trees (Cordyline Australis), lancewoods, Nikau palms etc. In the end I made a quilt because I had told Mary from Nancy's Embroidery shop that I'd enter. I had to make it in the time between getting back from Hong Kong and going off to the Coromandel on holiday with the family. I didn't bother about housework or anything anything for that week even though we took down the Christmas tree and the floor was covered in bits of Xmas tree plastic. While I was away I got a text from a friend saying "Thankyou for telling me about the Bernina challenge, I entered and I made a bach quilt". Groans from me, as I made a bach quilt too! Congratulations to the winner of the sewing machine, Rosemary Rush from Auckland for her Tuatara quilt. Which brings me back to the idea of Challenges and theme exhibitions. Are they a good thing? They break you out of a rut, get you making something and get your stuff out there and on show. OR do they take you off track and distract you? 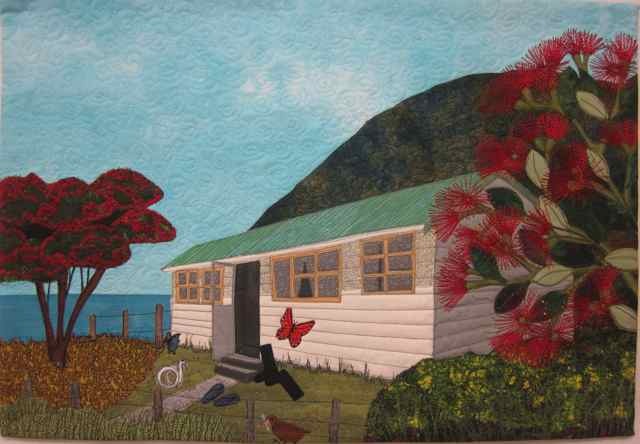 I'm not sure myself, all I know is that my quilt will be a useful image for this year's Christmas card and I finally got around to making a quilt with a picture of a pohutukawa tree on it (the tree with the red flowers). Well, back to work. 2 things to work on - an entry for the Nelson exhibition 'Changing Threads' due on the 17th of Feb and getting my eldest son organised. He has been accepted for music school in Auckland so will be moving out of home and into the student residences for a year. I went to the wedding dress exhibition at Te Papa in Wellington and it is great. Take your friends (and your Mum).